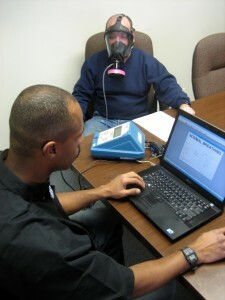 At Safety Compliance Services, we can come to your location and conduct fit testing using quantitative protocols to evaluate a respirator’s fit on an individual. Quantitative fit testing (QNFT) confirms a respirator’s fit by comparing concentration levels of a substance outside the respirator to the concentration levels of the same substance inside the respirator measured through a probe placed within the face piece. Passing a quantitative respirator fit test with a quantitative fit test machine proves that the face piece is sized correctly and the person knows how to don (put it on) correctly and provides an objective numerical data printout of the users fit test results including his or her fit factor. Unlike having such fit testing conducted by a medical services provider, our experienced technicians use the fit testing process to ensure the respirator is sized to provide the optimum fit for the user as opposed to merely passing the acceptable minimum fit needed for use in addition to educating your employees on the process and results so they fully understand proper respirator fitting and what effects the fit and seal of their specific respirator on their face. We take the time to probe each user’s personal respirator when conducting our fit testing to allow each wearer to use their respirator in the testing as opposed to a pre-probed respirator of the same make, model, and size as is often used by other fit test providers to save time and effort. Utilizing each users own respirator in the fit test process allows us to ensure that each respirator in use does not have any leakage that goes undetected with the standard fit check conducted when donning. By probing each individual respirator to be fit tested as opposed to using pre-probed sample respirators we have found a handful of defective respirators through our fit testing service over the years that otherwise would not have been identified as defective. Quantitative fit testing can be conducted in conjunction with providing your employees with annually required Respiratory Protection training or as a stand-alone service. Give us a call to discuss your respirator fit testing and training needs and current practices and we would be happy to discuss our services and cost. You may be surprised at how competitive our costs for fit testing service is and how much more value you and your employees will receive from our experienced fit testing technicians when compared with your current practices.